Treasure in the mail. My mum has sent me some more family photos. 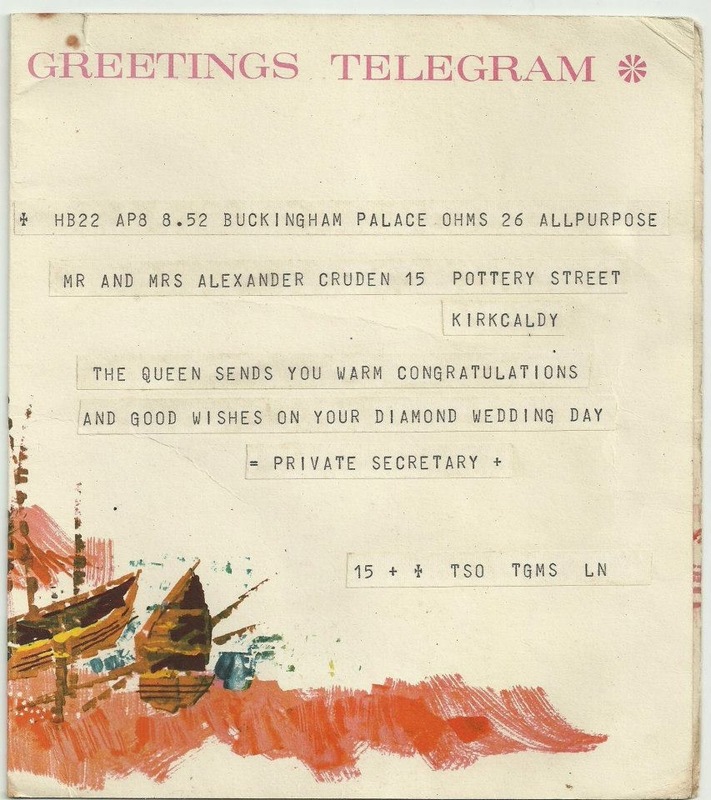 On their 60th wedding anniversary, my great grandparents got a telegram from the Queen. Many thanks to my cousin Lorraine Cruden for sharing this image. 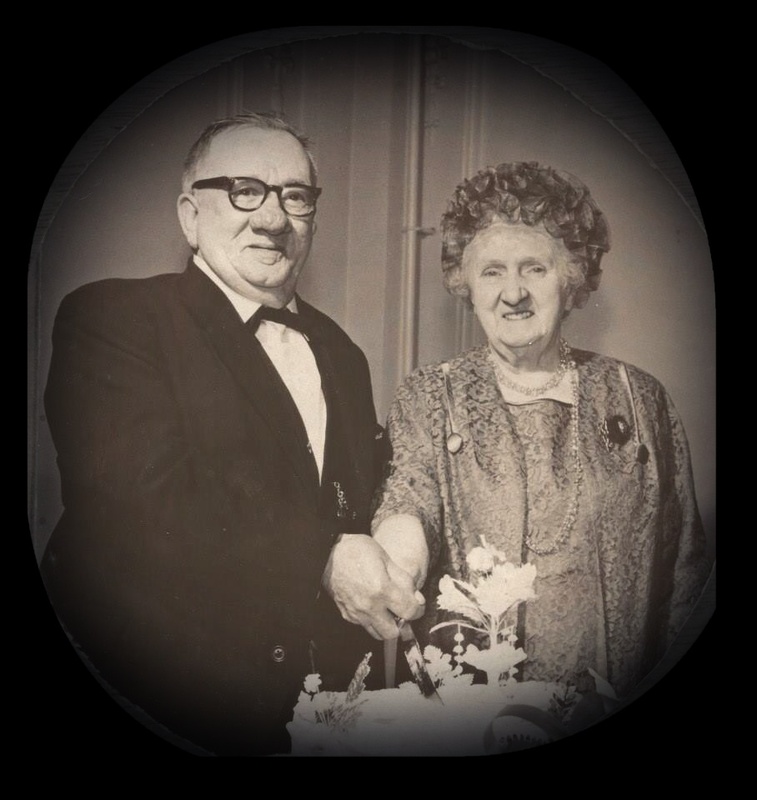 My great grandparents, Alexander Cruden and Catherine Simpson Bisset Black got married on 27 March 1908 in the Manse, Dysart, Scotland. 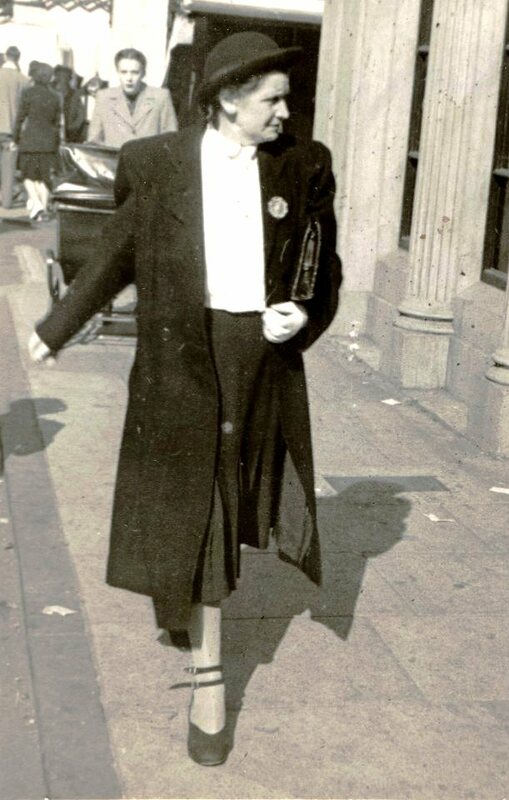 My grandmother was born about six weeks later. 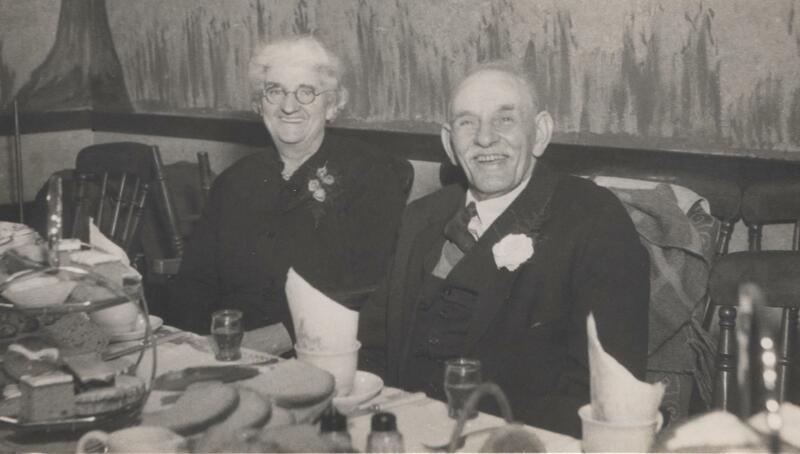 Their marriage lasted 62 years, until my great grandfather’s death in 1970 (on growing old together). If my house was on fire and I knew the Big T, the boy-child and the cats were safe, I think the only thing I’d try to rescue is my much-treasured collection of family photos. 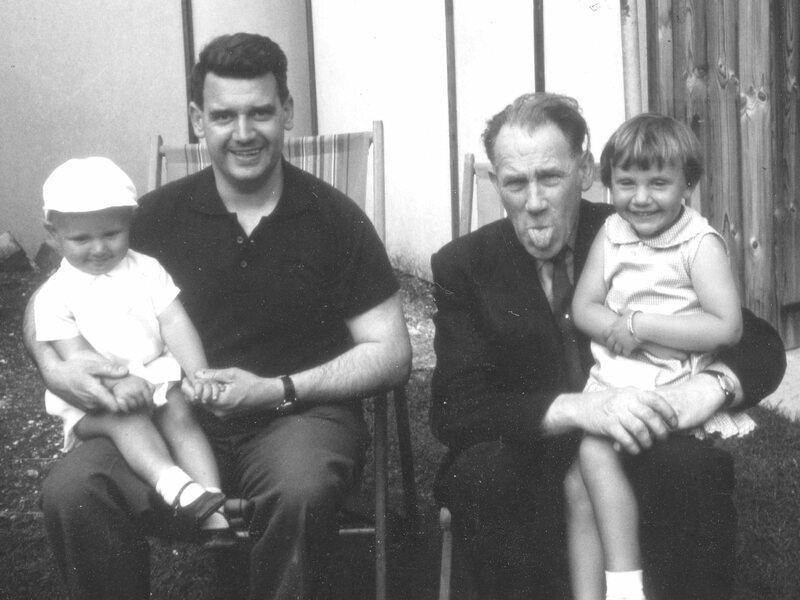 In these faces live my history – and perhaps wisps of my future. I see my nose and cheekbones, my son’s hair, eyes and his half-smile (one of those omg moments). I also see our temper, stubbornness and our shared sense of humour. 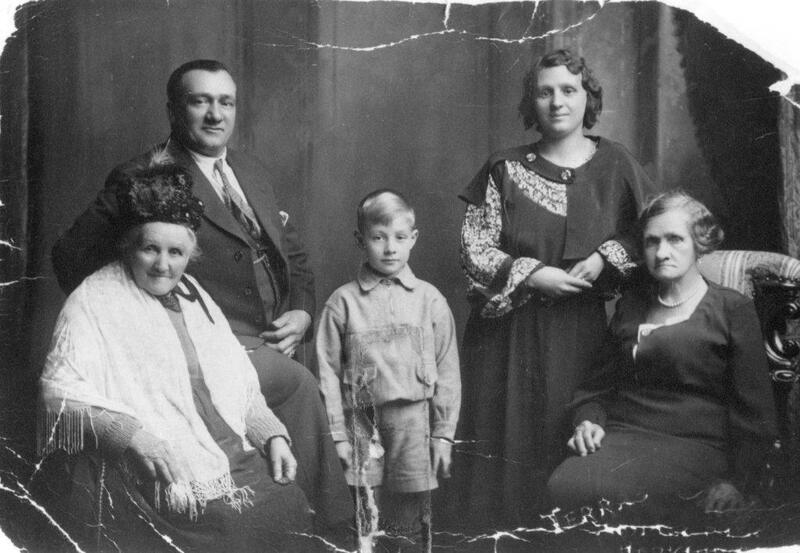 These are the men and women whose genes – and experiences – helped shape the woman that I am, and the man my son is becoming. 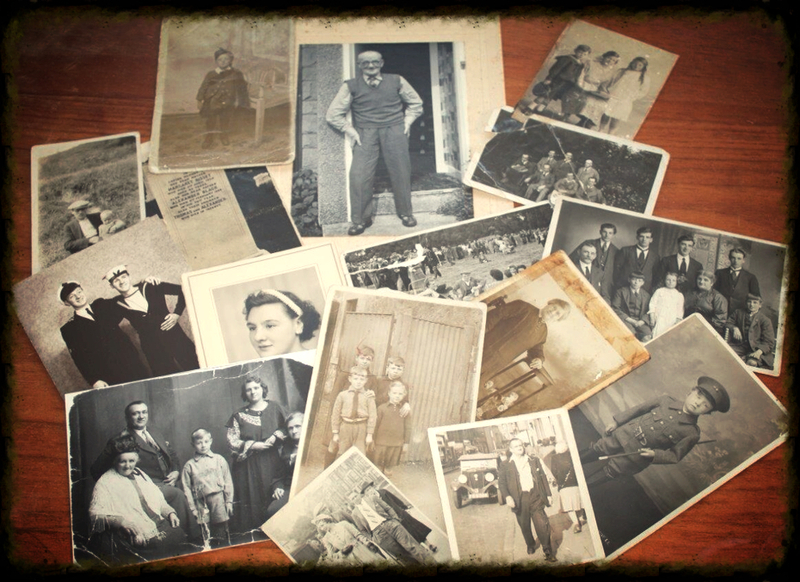 These photos are also one of the main reasons I began this journey to research and document my family history. More precisely, this is the photo that began it all. My mother gave me this quite a few years ago and it sat in a box with other “bits and pieces.” It was only when the Big T and I renovated our house and finally had the wall we’d always wanted for a “family photo gallery” that this one was dug out and framed. 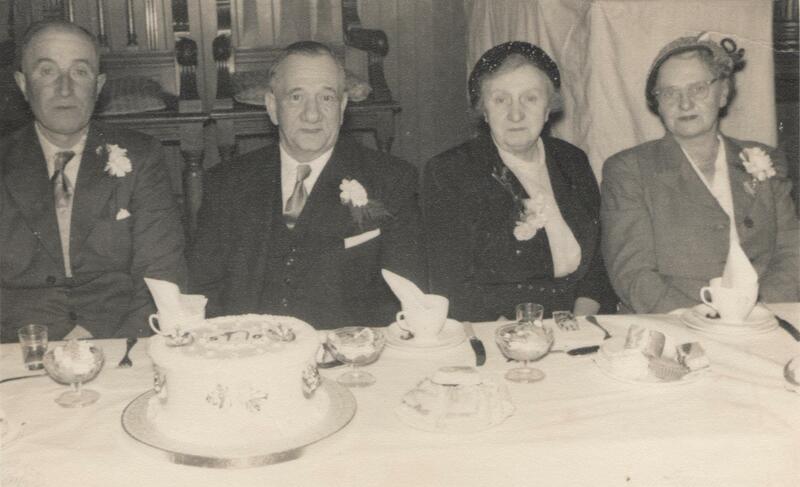 That’s when I realised I could only identify three of the people in the photo; my grandmother, Margaret Cruden, her son David Ramsay, and her father Alexander Cruden. 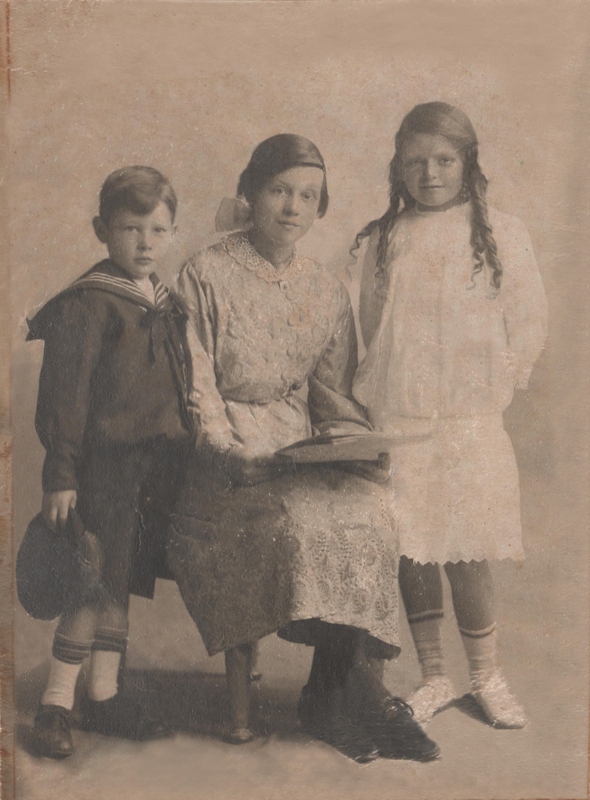 A quick phone call to my mum told me that the other two – older – women were Alexander Cruden’s mother and grandmother. It was an odd moment. 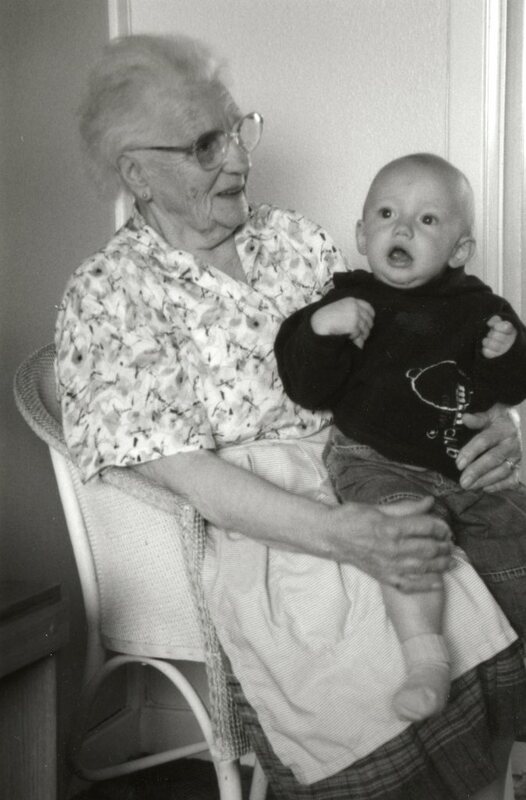 I knew that my grandmother was born in 1908, so I figured that her grandmother had to be at least 40 years older than her, and that the very old lady in the photo was probably at least 20 years older again. Suddenly, I was catapulted back in to the middle of the nineteenth century and I wanted to know about these people. 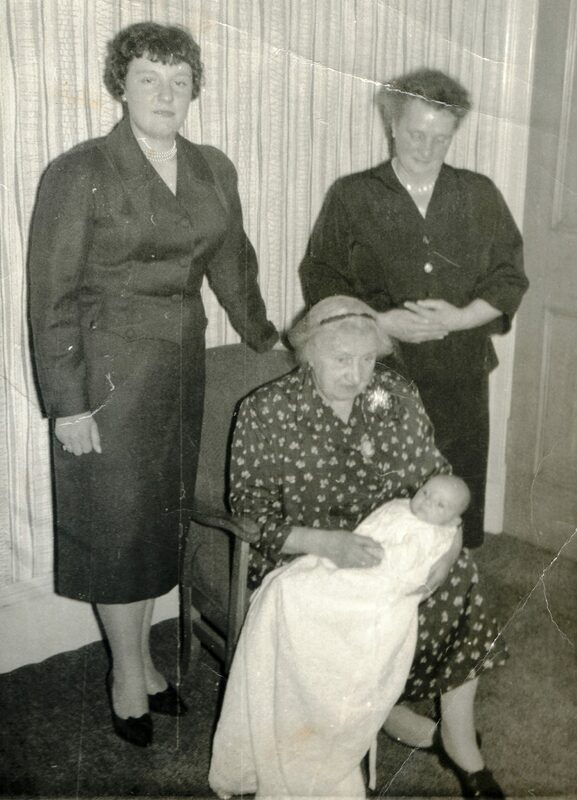 I’ve written quite a lot before about my grandmother (Fearless Females: Margaret Crudenand Not a kiss, but another celebration of marriage) and great grandfather (On Growing Old Together, On trying to put flesh on the ancestors’ bones) but next to nothing about the other women in that treasured image. The woman on the far right is Isabella Simpson Wallace. She was born on 2 May 1866 in St Madoes, Perthshire, the third child of Donald Wallace and Jane Morrison. Donald was an agricultural labourer, originally from Kirkmichael, Perthshire (Fade to black (and white)). Jane had been born in Dundee, but at the time of her marriage she was a domestic servant to the Lion family of Herverd Farm, Moneydie, Perthshire – where Donald Wallace was also employed. 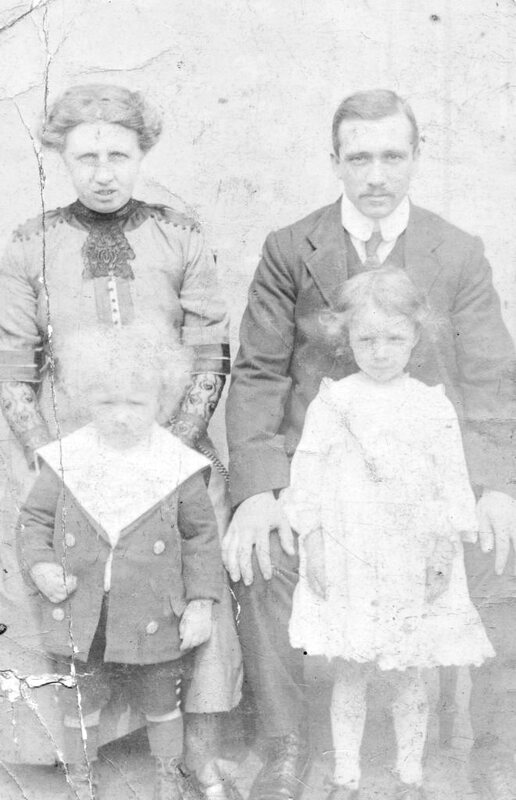 In 1869, a fourth child, James was born and in 1872, Donald Wallace died – aged only 42 leaving his widow pregnant with a fifth child, Christina. 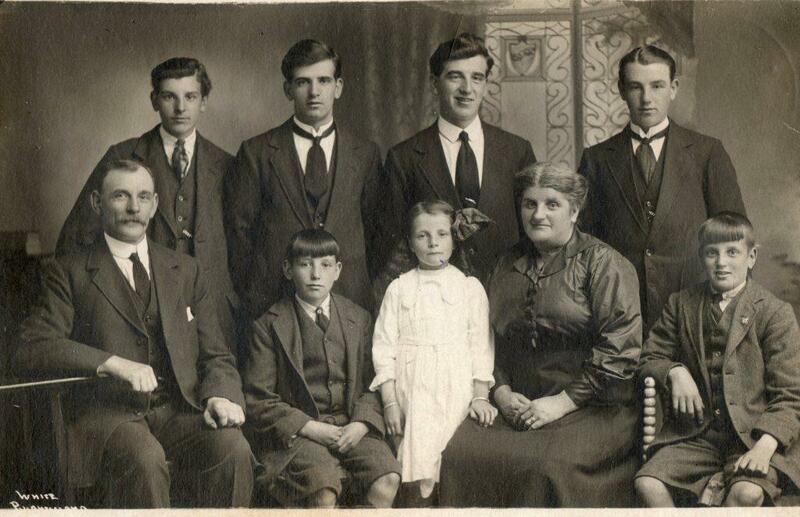 It seems that Jane took her children back to Dundee, and in 1873 married John Balsillie and bore him five children. The 1881 census shows the family living at Pitfour Street, Dundee. Isabella, age 14 is working as a sheeting weaver, along with her two older sisters Margaret and Ann. I know that two of Isabella’s daughters – Elizabeth and Isabella – also emigrated to the United States, and seem to have stayed there. 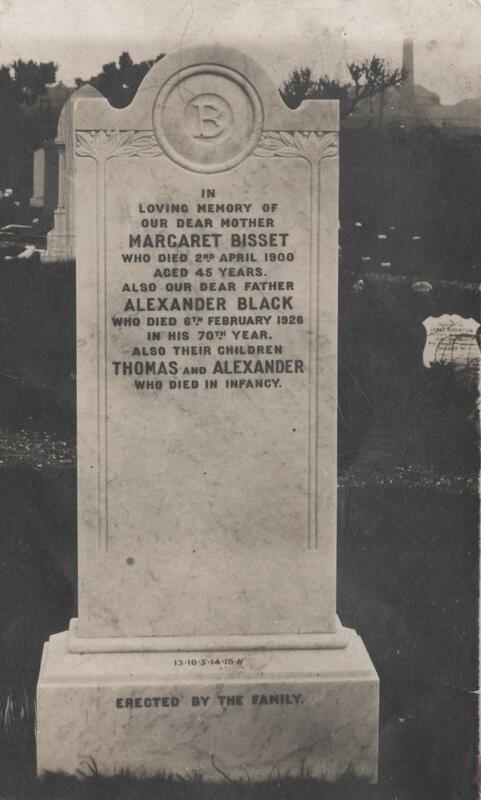 Betsy and my great-grandfather lived out their lives in Fife, while I recently discovered that Mary died in 1921, aged 19, of eclampsia, a few hours after giving birth to an illigitimate child (When the truth contradicts the “family folklore”). I am currently waiting to see if the wonderful people at the Lothian Health Services Archive (Family mystery about to be solved) can gain access to the child’s birth record so that I can find out whether Mary’s baby survived and what happened to him or her. My mum had told me that she was named after the old lady in the photo. She says that she remembers visiting her great, great, gran as a child, and that that this women had witnessed the aftermath of the Tay Bridge Disaster which occurred on 28 December 1879. As I’d been told that the photo above was of “five generations”, I assumed initially that the old lady was Isabella’s mother – Jane Morrison. The problem with this is that my mother’s name is Elizabeth, so my assumption immediately seemed unlikely. I haven’t been able to find any record of Jane Morrison’s death, so it is possible that she actually is the old lady and that my mother is mistaken about it being the woman she was named after. However, it seemed just as likely that the woman might be Isabella’s mother-in-law, so I began looking at the records for Stewart Cruden’s father – Alexander Cruden. And there I hit pay-dirt. Elizabeth Brown married Alexander Cruden in 1892, when he was fifty two and she was 41. 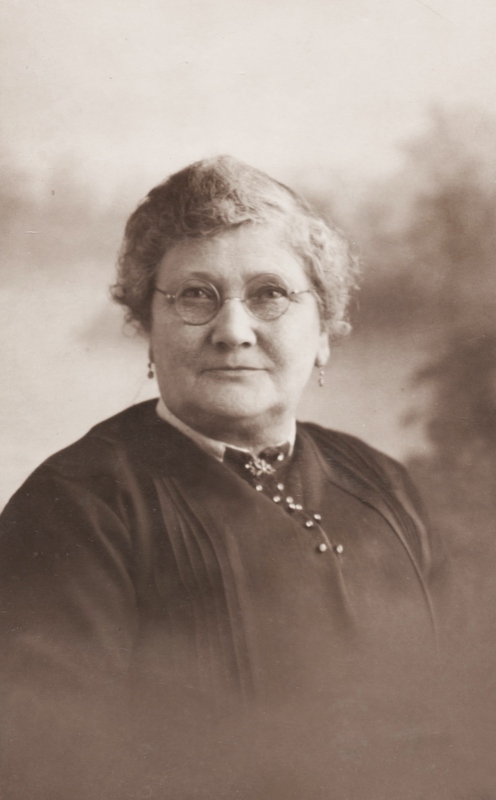 Elizabeth was a spinster and prior to their marriage, was Alexander’s housekeeper.However, while it was Elizabeth’s first marriage, it was Alexander’s third and although the couple had one child together – George Alexander- born in 1894, Elizabeth was the step-, rather than biological mother of Stewart Cruden. I suppose if I were more interested in lineage than history, this might matter. 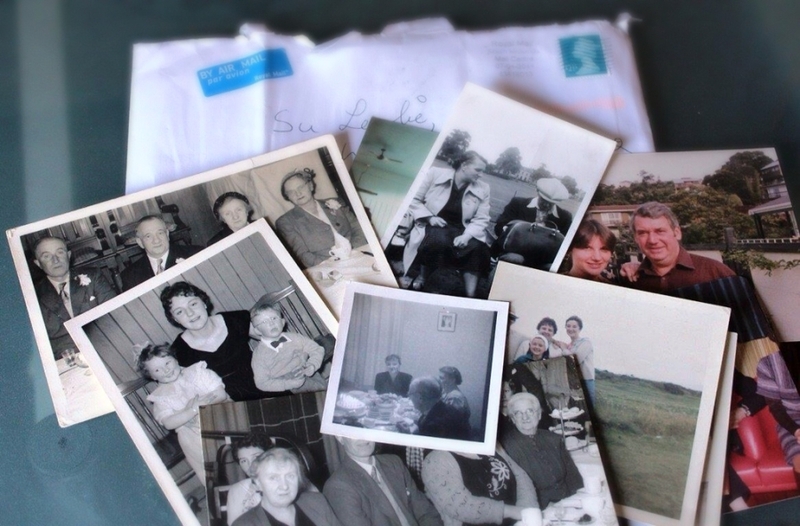 It might somehow “devalue” my five generations photograph. But of course it doesn’t! Elizabeth Brown joined my family by marriage; her son is my second great, grand uncle, and most importantly, she must have been much loved for my mother to be given her name. I’ve talked a lot about the concept of whanau – a Maori term that encompasses all those with whom we feel kinship. I feel kinship with Elizabeth Brown, and I treasure my photo of her. 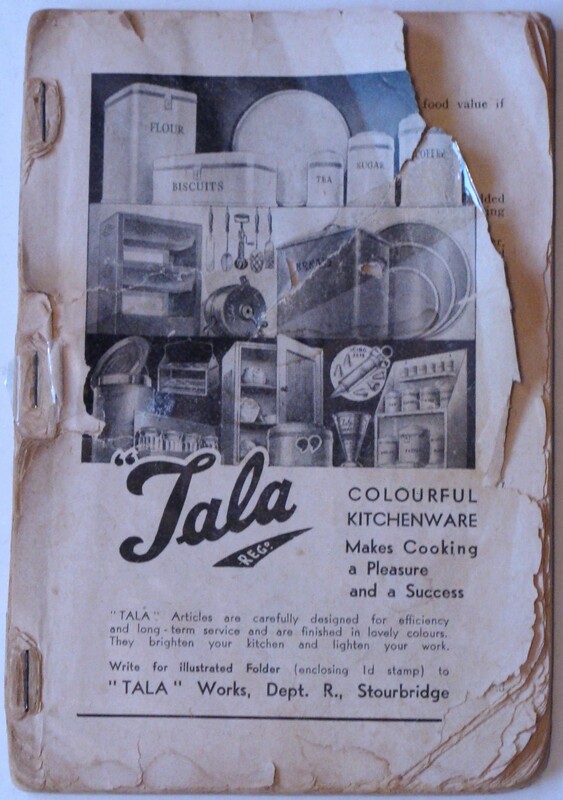 My grandmother’s cookbook – or what’s left of it. Since I agreed to become the family archivist, my mother has been sending me photos and objects that are somehow associated with our family. Given that her flat is scheduled for re-modelling soon, I suspect her motives are more about de-cluttering her place than preserving the past, but I’m grateful that she’s not just chucking everything into a skip. The latest parcel to arrive included a cookbook that belonged originally to my maternal grandmother. I remember it being used when I was a child – mostly by my dad for making tablet. 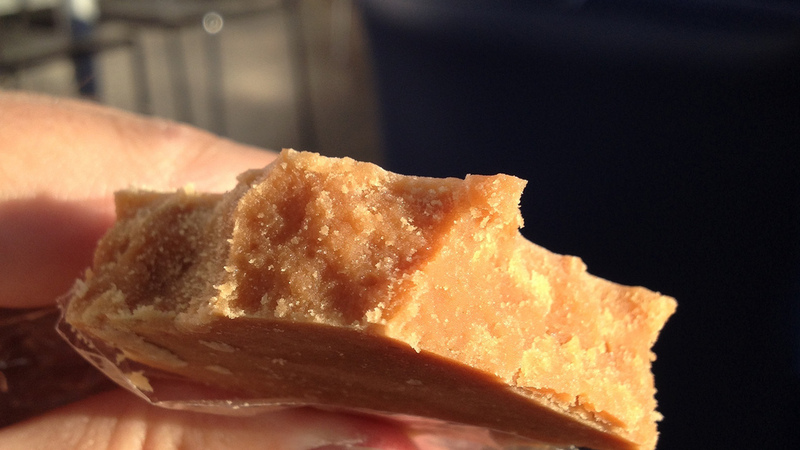 For anyone who doesn’t know, Scottish tablet is like fudge only much, much better. 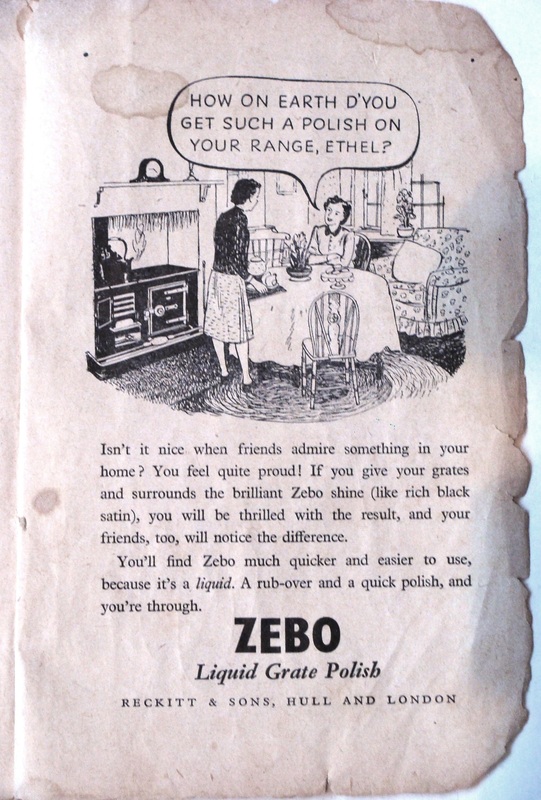 Zebo ad, from my grandmother’s cook book. Do the clothes and furnishings date the book to the 1940s? I have no idea what the book is called or when it was published. For as long as I can remember, it’s been missing the cover and probably a few other pages. From the look of the illustrations, it’s probably from the 1940s. I love old cookery books and this one is an absolute gem. I doubt I’m ever likely to make Potted Hough (a hough is the leg or shin of an animal), and I doubt the Big T would appreciate the recipe for Fried Steak which recommends cooking the meat for 15-20 minutes (until tender! 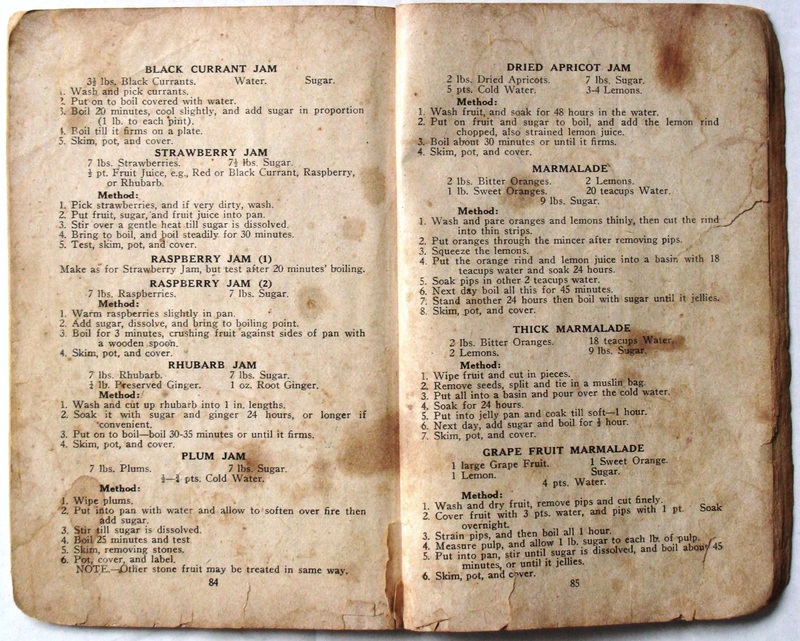 ), but judging by how stained the jam making pages are – these recipes are obviously really reliable. An indication of my family’s collective sweet-tooth; the jam and confectionery recipe pages look very well-used. Like a lot of old books of this type, it’s not just about cookery. There is a section on laundry – including care of your mangle, wringer and boiler (Chocolate Fish to anyone who can remember what a mangle even looks like), and even instructions on how to iron knickers (as if). Perhaps the most interesting thing about this book is that it is completely devoid of “personality.” It contains no illustrations of the food, no anecdotes about the recipe and even without a cover to tell me its origin, it feels institutional – not personal. This is not a book which celebrates food; and that more than anything places it in more utilitarian times.